1. 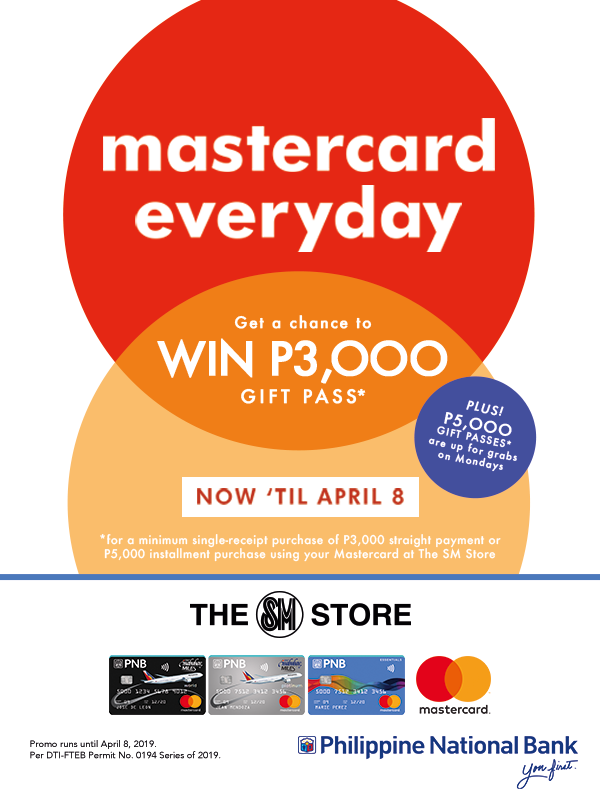 For a minimum single-receipt purchase of P3,000 for Straight Transaction and P5,000 Installment Transaction at any The SM Store using your PNB Mastercard Credit, Debit, or Prepaid card from January 21 to April 08, 2019 gives the cardholder a chance to instantly win up to P5,000 worth of SM Gift Pass. 2. There will be 100 winners of P5,000 every Monday and 120 Weekly winners of P3,000 SM Gift Passacross for non-Mondays (Tuesday-Sunday) at all SM Store. 4. Qualified transaction should be made from January 21 to April 08, 2019. 5. Promo period is from January 21 to April 08, 2019 while claiming of prizes will be from January 21 to June 07, 2019. Per DTI-FTEB Permit No. 0194 Series of 2019.